The Review: Remember 1996? It feels like a more innocent time now, when a director could blow up the White House without making the audience feel slightly uncomfortable. The events of September 11, 2001 not only had a profound effect on the world at large but also on the world of action cinema, and the excesses of action cinema of the previous two decades being replaced with the more forceful, intimate approach of the likes of the Taken movies. One other media event that 9/11 undoubtedly had a significant impact on was the TV series 24, which started less than two months after the Twin Towers fell. It also epitomised that more brutal manner, even as began more and more to embrace old school excess in its later seasons. A memorable series of episodes in season 7 saw terrorists from an imagined African nation take over the White House in an effort to further their cause; it seemed a concept ripe for a big screen makeover, and in 2013 we’ll get not one, but two, groups of terrorists taking down the White House. Part of the reason 24 felt the need to invent African terrorists was the lack of real world threats, as sadly there are no longer convenient superpowers likely to invade at a moment’s notice. Bad guys of choice these days, in a topical move which will hopefully date this film in decades to come, are the North Koreans, and there’s a Korean flavour to the threat placed on the President’s home address. President Benjamin Asher (Aaron Eckhart) is playing host to a delegation from the south of the peninsula when his residence comes under threat, and with the vice-president also at the talks, the taking of hostages leaves the Speaker Of The House (Morgan Freeman) in charge and quoting the standard non-negotiation speeches. Their only hope appears to be a Secret Service agent Mike Banning (Gerard Butler), removed from the President’s personal detail after an earlier tragedy but who just happens to be in the right place… at the wrong time. Olympus is a curious mix: the first act, including the titular falling, has very much the po-faced seriousness and thumping aggression of Noughties action films. The terrorists themselves have a fairly foolproof plan to get in (i.e. brute force), and don’t skimp on the bullets in their way through the front door. Once there, what they find is almost a relic of the Cold War; this relic, however, is of the Schwarzenegger or Stallone brand, that spouts one liners and deflects bullets by sheer weight of charisma. I believe that Gerard Butler has proven, beyond any reasonable doubt, that he’s capable of making some fairly dreadful romantic comedies; it seems he’s better at making moderate action movies, but certainly this one would have been more enjoyable if it had taken his lead and followed a lighter tone. Consequently it feels as if Butler’s in a different film to everyone else for long stretches, but you’d much rather be watching the one he’s in than the one you end up with. Apart from Butler, the other thing that seems to be left over from the Nineties is the effects work, as anything in the sky or in broad daylight looks like stock footage from an almost pre-CG era. Much of the rest of Olympus is an exercise in how to assemble a top quality cast and then absolutely waste them, an exercise conducted with almost military efficiency. In addition to Freeman and Echhart, everyone from Oscar nominated talent including Melissa Leo and Angela Bassett to Golden Globe winner Dylan McDermott and even twice Fangoria Chainsaw Award nominated Radha Mitchell get nothing to do, and each and every one conducts themselves with the enthusiasm of someone being forced to work to pay their overdue gas bill. Increasingly Training Day looks like an aberration on Antoine Fuqua’s CV, with the tension and drama of Olympus more in line with his other works such as Shooter or King Arthur. Based on this evidence, it would be worth someone taking a punt on Gerard Butler if you’ve got a cheesy Nineties action movie burning a hole in your desk draw, so long as you invest it – and the supporting cast – with more energy than this managed. Why see it at the cinema: If you can overlook the early shoddy CGI, then there’s a reasonable amount of spectacle, and Butler’s performance is likely to elicit a good deal of laughs or groans for you to share. What about the rating: Rated 15 for strong bloody violence and strong language. It’s reasonably sweary and quite stabby, and more satisfying in that sense than the 12A action movie that seems to have become de rigeur these days. My cinema experience: A reasonably full house at the Cineworld in Bury St. Edmunds. A fairly standard amount of trailers and adverts, no sound or projection issues to speak of, and the audience by and large seemed to enjoy themselves. 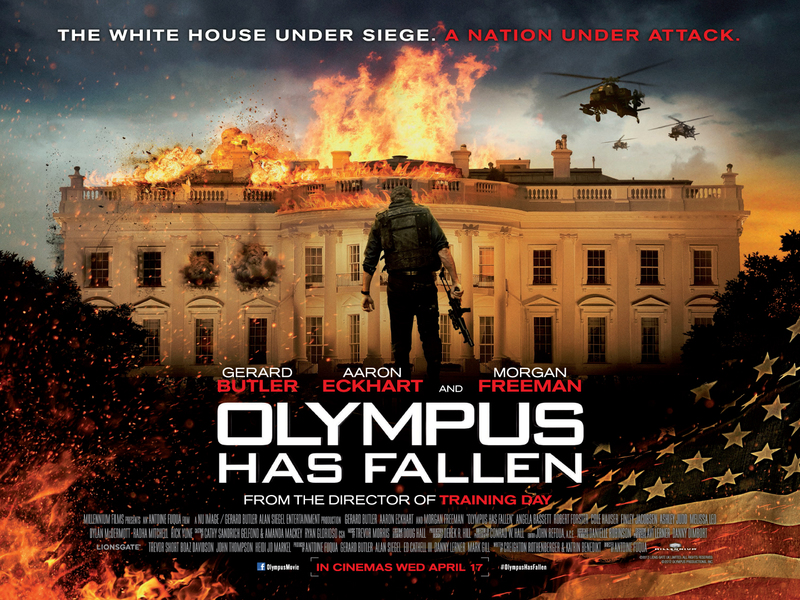 This entry was posted in Reviews and tagged 2013, Aaron Eckhart, Antoine Fuqua, film, Gerard Butler, Morgan Freeman, movies, Olympus Has Fallen, review. Good review dude. I hated this movie.